You can use Addappter without logging in. However, in this case there won't be any personal statistics for installed applications and downloaded books. If other Addappter users work on the same computer, all installations and downloads are added together. Also, you need to log in to install paid applications. Personal Yandex services (Yandex.Music, Yandex.Disk, Yandex.Mail and others) use the same account for authorization. If you are registered in any of these services, use the same account to log in to Addappter. If you don't have an account yet, you need to register. Go to the Authorization tab. Choose the Add user item. Create and enter your PIN code (any four numbers). The PIN code is created each time you log in. It is used to verify the account when installing paid applications. The program remembers your account. If you don't log out, you don't have to enter the password next time. The program allows multiple users to be logged in at the same time. Statistics of application installations and book downloads are counted for the user whose account is displayed in the upper right corner of Addappter. 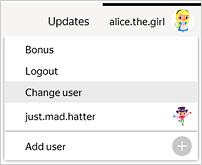 Click the current user account in the upper right corner of Addappter. To prevent other users from entering your account, log out when you finish working in Addappter. To do this, click on your account and choose Logout in the upper right corner of the program. 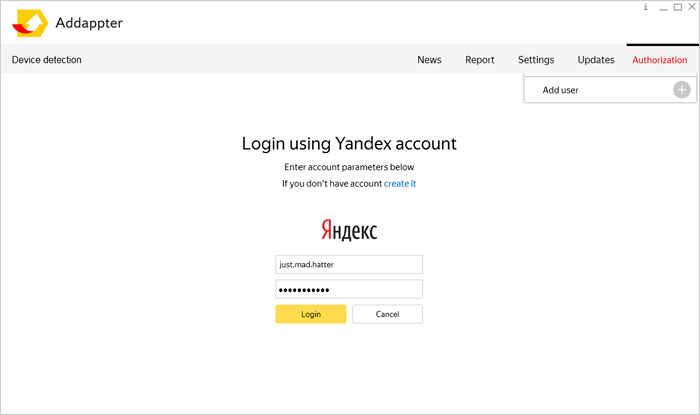 If you don't remember the username or password for Addappter, use the recommendations in the Solve problems section of the Yandex.Passport help. Why do I need to log in?Logging in to the programUsing multiple accountsWhat if I forgot my username or password?